The look of Windows has evolved over the years -- some would say at a largely glacial pace -- and with an incremental update to follow Windows 10 Creators Update we're in line for the latest change. Known as Project NEON, this is not a major overhaul of the Metro or MDL2 (Microsoft Design Language 2) look, but it introduces some new ideas in the form of Acrylic. Some of the features of NEON can already be seen in the latest builds of apps such as Groove Music, and Connected Animations. Acrylic brings blurring effects to apps not only to create a sense of depth, but also to help improve focus and reduce distractions. Leaked images give us a pretty good idea of how things are going to look. Screenshots shared by MSPoweruser show how Project NEON will change the look of Window 10, and it is thought that the new look will play an important role in HoloLens and 3D content. It is described as "essentially bringing back Windows 7's Aero Glass and mixing it up with animations like the ones from the Windows Phone 8/7 era". The updated design language borrows heavily from ideas that are already widespread online. 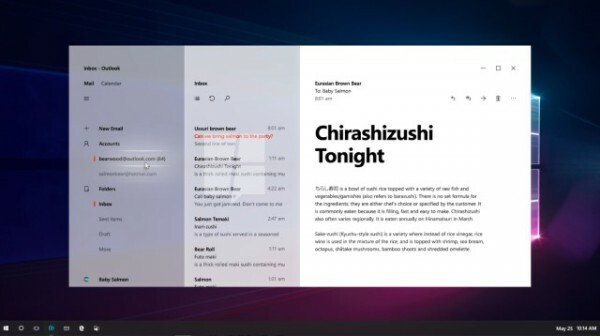 For instance, the Connected Animations feature is visible in Groove Music when you scroll down the page and the artist image gradually shrinks in size -- something found on many websites in different forms. Project NEON also introduces some "stupendously smooth" animations and we should start to see something more official when Microsoft starts Redstone 3 builds.